On Thursday, November 2, a Spanish judge sentenced eight of Catalonia’s separatist leaders to prison under accusations such as sedition, rebellion, and misuse of funds. These accusations may lead to thirty-year jail sentences for each of the leaders. Additionally, eleven lower tier officials have also been charged. Occurring merely a week after the Catalan Parliament’s vote to secede, this situation has prolonged the brutal clampdown on separatist breakaway efforts. By the prosecution’s request, the former officials are to be remanded in custody until the trials are underway, denying their freedom on bail. This decision also means that high-profile Catalan separatist leaders will most likely not be able to run in the December 21st regional elections that Spanish Prime Minister, Mariano Rajoy called after dismissing the government. Also by the prosecution’s request, Judge Carmen Lamela is considering issuing an arrest warrant for former Catalan president, Carles Puigdemont, who––along with four of his ministers––fled to Belgium on Monday. The extradition request is likely to set off diplomatic tensions between Spain and Belgium, since Belgium allows E.U. citizens to claim political asylum. It helps that the nation is partially controlled by Flemish nationalists who are sympathetic to the Catalan separatist cause. On Tuesday, Belgian Prime Minister, Charles Michel offered words in Puigdemont’s defense. He states, “The Belgian government did not take any steps to encourage Mr. Puigdemont to travel to Belgium. Mr. Puigdemont has the same rights and duties as any European citizen, no more no less.” As of now, the former president has not applied for political asylum. 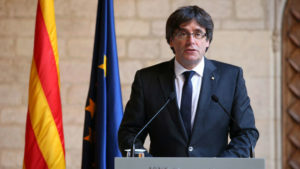 In a televised address to Catalonia which appeared to be recorded from his hotel room in Brussels, Carles Puigdemont stated that he remains Catalonia’s leader and demanded that members of his deposed government be released. Having refused to appear in Madrid court earlier that day, Puigdemont justified his absence by saying that the charges against him were politically motivated and that Prime Minister Rajoy’s decision to use constitutional powers in order to strip the separatist of office was illegal. Some activists have questioned Puigdemont’s decision to flee to Belgium and set up a government in exile while his allies are forced to face charges back in Spain. But the former president claims that if he and his colleagues had remained in Catalonia, “I am convinced, according to the information I have, that there would have been a violent reaction.” Other activist praise him for his retreat, viewing it as a strategic move that allows him to continue fighting for Catalonia in the center of the E.U. And Puigdemont aims to do just that. He said Tuesday that he plans to push Catalonia’s case inside the European Union and across the world in an effort to jumpstart the struggling independence movement. In the last seven years, the Catalan independence movement transformed from an almost irrelevant force into an undisputable threat towards Spain’s national integrity. And in the last month, that same alliance––due to the Spanish government’s harsh crackdown––has reverted back to a fragile and unwieldy state. Crestfallen but unyielding, pro-independence forces say they need to find a way to retake the initiative. They hope that the Catalan elections in December will help them do just that, and possibly offer them another chance at freedom. First-year Sunya Hassan is a staff writer. Her email is shassan@fandm.edu.